CPM One Source was chosen for the design and management of Traveling Coaches’ new headquarters in Plano, Texas. Traveling Coaches is the recognized leader in the legal technology arena providing training, application configuration and consulting services to law firms throughout the country and around the globe since 1995. The CPM team designed and coordinated the transformation of a ground floor suite within the Parkway Centre II building. At the beginning of the project, the real estate broker and client approached us with the challenge of designing a space that would excite them. Discouraged after looking at close to a dozen fit plans from other sources, the client asked us to design their new office with “a clean slate.” Our design team took a fresh approach and based on the client’s workplace functions, designed an open and collaborative environment, creating team environments and utilizing the MAI glass wall systems. The client was thrilled and truly excited about the new design! CPM designed and space planned the entire office suite, including private offices, break room/ kitchen, conference rooms, training room, lounges and works spaces. Our team developed and presented 3d rendering views, perspectives, materials & presentation boards, and designed and specified custom millwork, all while simultaneously coordinated with the client as well as other outside vendors. 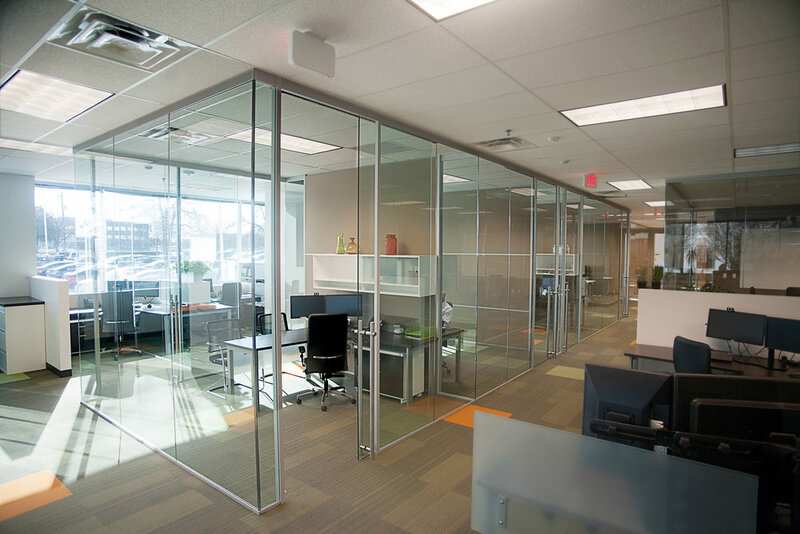 By using glass walls, the office was given a bright and open collaborative space, allowing for the natural light and outside views to filter in. The project went off without a hitch, resulting in a beautifully designed open office space and a very happy client. Special thanks to the entire project team: Michael Pratt, Project Manager, and Michael Fontinot, Jobsite Supervisor from K2 Construction; and Karrie Ann Zinna, Project Manager, and Javier Juarez, Installation Foreman from Modular Architectural Interiors (MAI). Find Out What We Can Do For Your Office!